IEEE 802.11 n/g/b Wireless Mini PCI-Express Module. 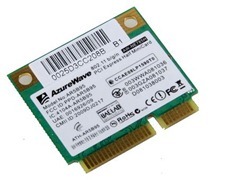 The AW-NE785H wireless Mini PCI- Express module is a highly integrated wireless local area network (WLAN) solution to let users enjoy the digital content through the latest wireless technology without using the extra cables and cords. High speed up to 300Mbps data rate. how to enable my wifi with msi u135dx?